Create a new Spring tradition with our double chocolate-coconut macaroons. 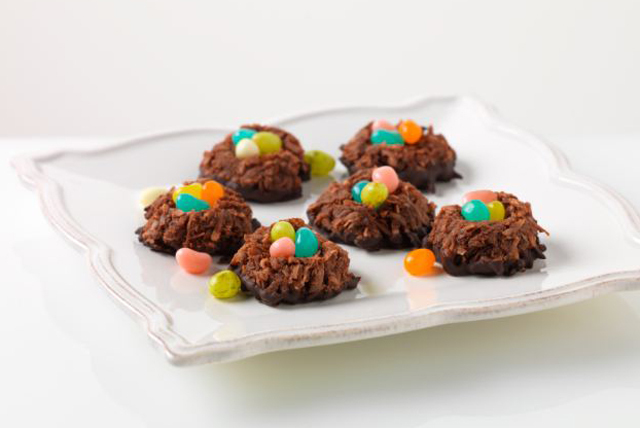 These simple cookie creations double as nests with colourful candy eggs. Combine dry pudding mix, coconut, milk and vanilla. Drop by heaping teaspoonfuls, 1 inch apart, into 30 mounds on parchment-covered baking sheets. Bake 12 to 15 min. or until firm. Immediately transfer macaroons from baking sheets to wire racks; press 3 jelly beans into top of each. Cool completely. Melt chocolate as directed on package. Dip bottoms of macaroons in chocolate; place on waxed paper. Let stand until chocolate is firm. Prepare using 1 pkg. (4-serving size) Jell-O Vanilla Instant Pudding and almond extract. Prepare using Baker's White Chocolate. Store leftover sweetened condensed milk in tightly covered container in refrigerator up to 1 week. Serve over cut-up fruit or hot cooked oatmeal. Or for extra flavour, stir into your cup of hot brewed coffee or tea instead of regular milk.